The term puddingstone covers conglomerate sedimentary rocks of several materials. 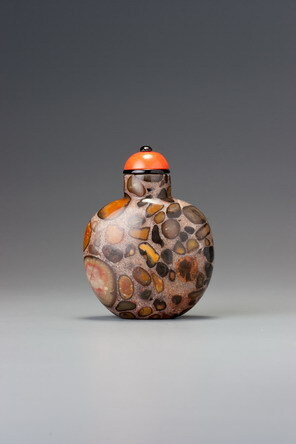 The distinctive kind of quartz conglomerate seen in this snuff bottle consists mostly of pebbles of flint (which is also a variety of quartz) in a siliceous matrix, and it is remarkably similar to Hertfordshire puddingstone from south-eastern England. The material was not used by the lapidary in China before the appearance of the snuff bottle, apparently, although the softer limestone puddingstone that we saw in Sale 2, lot 35, was. The National Palace Museum in Taiwan possesses some porcelain thumb rings enamelled to imitate a similar siliceous puddingstone; the potters have made the sandy matrix portion much lighter in colour, however, and the pebbles are greyer. For a range of bottles in puddingstone, see Stevens 1976,nos. 609–611 and 613-617. 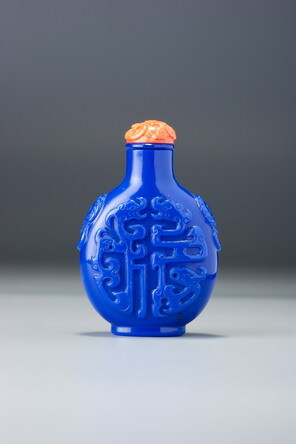 Other than in its material, the form of this bottle is typical of the range of continuously curved shapes, which seem to show off the material at its best and which the snuff-bottle maker obviously favoured. It is reasonably well hollowed, well-formed but without any frills (apart from the slightly convex lip), and feels comfortable in the hand. It might have been made at any time from whenever the material was first introduced until the early twentieth century, although its most likely period is the mid-Qing.